All the comfort of the PolySorb ProForm insole but thinner. 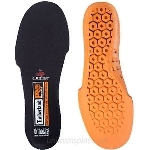 Total Support insole offers optimum interface between your feet and the ground. Dual density padding protects heel. Thermoplastic gel cushions heel and returns energy. 1/4 inch thick SpenCore pad cushions heel inpact. Low friction top cloth helps prevent blisters. Countoured support for metatarsal arch. Low friction top cloth helps prevent blisters.